The General Assembly directed JLARC to review the cost-effectiveness of Virginia’s Medicaid program. Medicaid spending increases have outpaced total state budget growth over the past 10 years, requiring a greater portion of the Virginia’s budget resources. The Virginia Medicaid program provides medical, long-term care, and behavioral health services to more than one million individuals each year. The Department of Medical Assistance Services (DMAS), which administers the program, paid $8.2 billion for services in FY15, half of which was from the general fund. Total inflation-adjusted growth of Medicaid spending per enrollee in Virginia was nearly flat—just 0.36 percent, adjusted for inflation—over the past five years (FY11–FY15). Total spending increased due to rising enrollment (16.5 percent enrollment increase). Enrollment growth was due to a variety of factors, including increased program awareness and additional waiver slots for individuals with intellectual and developmental disabilities. Medicaid spending places increasing pressure on the state general fund budget, even though per enrollee spending growth has been flat in real terms. Medicaid general fund spending has grown by an average of 8.9 percent annually over the past 10 years, while total general fund spending increased by just 1.3 percent. Medicaid spending comprised 22 percent of the general fund budget in FY16, increasing from 14 percent in FY07. The current process to determine functional eligibility for long-term services and supports (LTSS), and inadequate DMAS oversight, create the risk of unreliable screening results. The cost of services for this population is high ($2.35 billion in FY15), and reliable eligibility screening is critical to ensure equitable access to services for only eligible individuals. The tool used to screen applicants has never been validated for use on children, who comprise an increasing number of LTSS applicants and recipients. There are also more than 200 entities that perform screenings in Virginia, including hospitals and community-based teams, but consistent training for these teams is not provided or required. There is significant variation in screening results across these entities, with approval rates across community-based teams ranging from a low of 37 percent to a high of 98 percent in FY16. Once individuals are determined to be eligible for LTSS, they need to be provided appropriate services in the most cost-effective setting. Virginia has demonstrated success in recent years keeping recipients in the community (known as rebalancing), rather than in higher-cost institutional settings, but there are opportunities for further rebalancing. MCOs will be responsible for many aspects of rebalancing following the implementation of MLTSS. Other states use strong incentives for MCOs to serve recipients in lower cost community settings. Under the current fee-for-service system, a conflict of interest exists for providers, who determine type and amount of LTSS services. A provider’s financial interest may conflict with the state’s interest in ensuring cost-effective and appropriate care. This conflict of interest will continue to some extent after DMAS transitions to its managed LTSS program. DMAS has historically taken a passive approach to MCO financial oversight, instead prioritizing efforts to oversee managed care quality. Focusing on quality can produce long-term cost savings, but this needs to be balanced with strategies to more directly control spending. DMAS has not maximized opportunities to control spending, and as a result, MCOs earn higher profits in Virginia than in other states. DMAS currently does not obtain and analyze sufficient data to effectively oversee MCO spending. This limits its ability to ensure that capitation rates are not higher than necessary and that profit caps are effectively enforced. DMAS has also not enforced a majority of sanctions under its new contract compliance process. DMAS has not strategically set capitation rates paid to MCOs to ensure they are not higher than necessary, leading to larger than anticipated MCO profits. 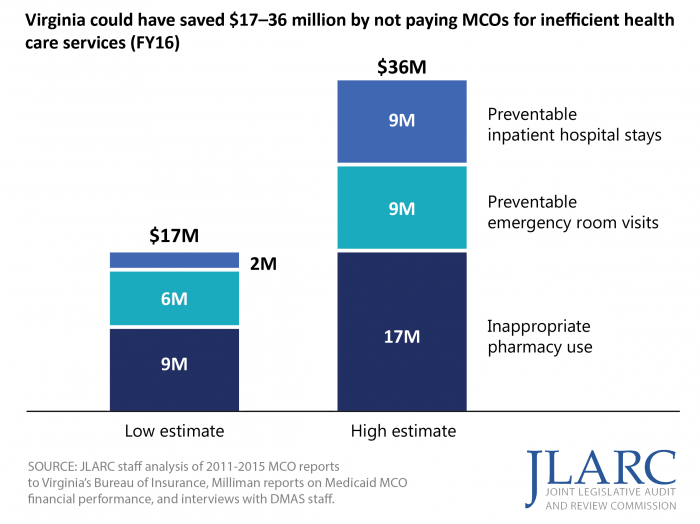 DMAS has not identified and adjusted MCO capitation payments for inefficient spending on preventable emergency room visits, hospital stays, and inappropriate pharmacy use. In FY16, Virginia could have saved $17–36 million by not paying MCOs for the inefficient provision of services. DMAS also does not adjust administrative spending for enrollment increases, and these adjustments would have reduced spending by as much as $8 million in FY16. DMAS uses a profit cap, but Virginia’s cap is more lenient than other states. The profit cap is an effective tool to retroactively ensure the state does not overpay MCOs and limit the state’s risk if capitation payments are higher than necessary. Virginia MCOs have made profits that are, on average, above actuarial and national benchmarks. Three other states use a profit cap similar to Virginia’s, and all three require MCOs to repay funds at lower profit levels than Virginia. Direct DMAS to develop comprehensive training curriculum for individuals who screen applicants for LTSS eligibility and amend the Code of Virginia to require all screeners be trained and certified. Direct DMAS to identify the steps required to ensure that LTSS screenings performed by hospitals are done consistently and do not lead to unnecessary institutional placements. Direct DMAS to implement a more stringent, tiered profit cap for the Medallion program and implement a profit cap for the MLTSS program. DMAS should develop consistent, mandatory training for LTSS functional screenings and test screening results for reliability. DMAS should implement a strong incentive, through a blended capitation rate, for MLTSS MCOs to serve recipients in the community. DMAS and its actuary should adjust Medallion capitation rates for expected efficiencies. DMAS should obtain and use robust spending, utilization, and population-specific data to improve its oversight of MCOs.